BETHLEHEM (Ma’an) – A man was found dead Saturday in his apartment in Ayda refugee camp near Bethlehem in the southern West Bank, and three members of a family suffered from asphyxia. Palestinian Red Crescent medics in Bethlehem said they were notified about an emergency in Ayda camp, but as the rescue staff arrived, they found Khalid Ibrahim Radi, 45, had died six hours beforehand. The body was taken to Beit Jala Hospital. A statement added that an ambulance was sent to rescue a couple and their 9-month old son in Bethlehem. The three suffered from lack of oxygen because they left a gas heater on. A 30-year-old man, his wife, 23, and their child received first aid at home. On Friday a woman gave birth in an ambulance after snow blocked her route to hospital in southern Bethlehem. The mother and baby girl were later transferred to hospital and both were in good health. Emergency services chief in Bethlehem Abdul Halim Jaafra said ambulances had rushed to the pregnant woman's home in Beit Fajjar village. She delivered her child on the way to Beit Jala government hospital, as Bethlehem saw its first snowfall in four years, blocking roads in the southern West Bank city. Palestinian medical sources in the Gaza Strip reported, Saturday, that one resident was killed and several others were injured after falling into a siege-busting tunnel along the Egypt border in Rafah, in the southern part of the coastal region. The sources identified the youth as Tha’er Madi, in his twenties, and added that the two wounded residents suffered serious injuries. The Palestinians depend on the tunnels for their basic supplies due to the deadly Israeli siege that was imposed on Gaza five years ago. More than 200 Palestinians have been killed in similar tunnel incidents, and more than 800 have been injured since 2006. Some of them were killed and injured due to tunnel accident, and many other were died of injured after the Israeli army bombarded tunnels while they were in them. The siege has left Gazan hospitals and medical center out of basic and specialized supplies and equipment, an issue that has led to the death of more than 400 patients, including infants and children. Many patients died while waiting permits from Israel to cross the border for medical treatment. GAZA CITY (Ma'an) -- An accident inside a smuggling tunnel under the Egypt-Gaza border has killed one man and injured two others, Palestinian medical officials said Saturday. TULKAREM (Ma'an) -- Nine people were injured in a road accident in Tulkarem on Thursday, Palestinian civil defense crews said. Two buses crashed in the east of the city, with rescue crews having to evacuate people trapped in the vehicles. The injured were transferred to hospital for treatment. HEBRON (Ma’an) -- A 53-year-old man died in Hebron on Tuesday after falling from a shopping center rooftop while hanging an advertisement, police said. 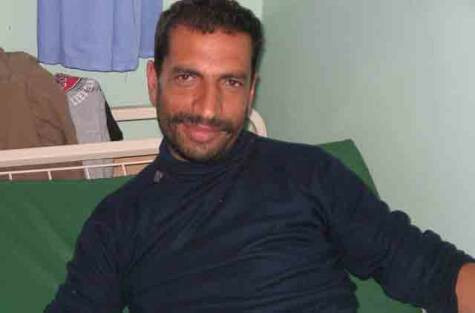 Abdul Fattah Qawasmeh was taken to hospital but died from his injuries. BETHLEHEM (Ma’an) -- One man was killed and five others injured in a car accident in Bethlehem late Sunday evening, medics said. Red Crescent officials told Ma'an that Murad al-Jabari, 33, was killed in the high speed accident. The wounded were taken to Beit Jala hospital for treatment. One man was described as being in a serious condition, while the others received moderate injuries. GAZA CITY (Ma’an) -- A young man was killed on Sunday evening in a traffic accident in the Gaza Strip. Adham al-Abadleh, 22, died when his motorbike crashed in Khan Younis. A passenger was also seriously wounded. Both men were taken to Nasser hospital. HEBRON (Ma’an) -- A two-year-old toddler died on Thursday morning after drowning in a well in south Hebron. Red Crescent official Nasser Kabaha told Ma'an that Muhammad Abu Fanar drowned after falling into a well near his house in Yatta village. GAZA CITY (Ma’an) -- Civil defense in the Gaza Strip reported Wednesday that a Palestinian fisherman drowned while working off the coast. Ghanem Abu Jarad, 62, from Khan Younis was rescued by other colleagues but he died of his injuries, civil defense reported. JERUSALEM (Ma’an) -- A five-year-old boy injured in a deadly school bus crash near Ramallah last week has died from his injuries, medics told Ma'an on Monday. Salah Dweik was severely wounded when the vehicle collided with a truck near the Jaba checkpoint north of Jerusalem on Thursday. Five of his elementary school classmates and a teacher were killed when the bus overturned and set ablaze. He was treated in Hadasa Ein Karem hospital in Jerusalem, but died from his injuries on Monday, doctors said. The boy's funeral will be held on Tuesday afternoon in Al-Aqsa mosque. The children had been traveling from Shufat refugee camp to a playground near Ramallah for a school trip. The deadly accident caused widespread shock, and PA Prime Minister Salam Fayyad announced a cross-ministerial commission of inquiry on Saturday. It is impossible to ignore what is happening to us: Palestinian children die in an accident, and many Israelis are happy about it - and are no longer even ashamed of it. The all-clear was sounded as soon as the news came that the school bus was Palestinian. Only the most perceptive viewers of Thursday's accident - in which nine children and one adult were killed when their bus collided with a truck north of Jerusalem - could make the distinction. But something in the manner of the coverage intimated at it immediately. Then the reports and images started flowing in. The coverage was workmanlike overall, if faceless and depersonalized. It is not difficult to imagine how such a horrific accident would have been treated had the children been Jewish: with a lot more blood and tears. There is no disputing that, as the Talmud says, "Every person is partial to himself" - and to his own people, we might add. One can also excuse the ridiculous way the Jerusalem-Ramallah road by Aram, near the north side of the capital, suddenly became "beyond the Israeli border," in the language of reporters - the Green Line springs to life when it suits us. But what came next cannot be excused. The Internet roiled - not with the usual anonymous comments, the last refuge of boors and perverts. This time they revealed their names and their Facebook photos, spewing forth nauseating, hate-permeated racism that seemed to exceed anything seen here previously. "Relax, these are Palestinian children," Benny Dazanashvili wrote on Twitter. To which Tal Biton responded, "It seems these are Palestinians ... God willing." Itai Viltzig offered up a prayer: "I hope every day there is a bus like this." Dozens, if not hundreds, of Internet surfers said a prayer of thanks - for the terrible death by fire of young children on a school field trip - and the responses were featured on the web pages of the prime minister and the Israel Police and the Walla! web portal. "They'll want money, because money is more important to them than the children who were killed," one person wrote. Others commented, "Can we send another truck?" and "I'd have sent a double semi-trailer to obliterate all those shits." On the official Facebook page of Prime Minister Benjamin Netanyahu, who was actually quick to express his sorrow from faraway Cyprus over the accident, the comments are still visible like some mark of Cain on their authors and their host. From Yisrael Ohana: "I don't care; for my part every Palestinian child is a future suicide-bomber candidate. Tomer Ben Haim: "There is just one thing that anyone who attacks Judaism deserves." The only light came from Meira Baruch, who wrote: "I'm 63 years old. Only a few times in my life have I been ashamed to be a Jew. Today I am ashamed. How can anyone rejoice over the death of little children?" No longer can all this be waved away with the argument that these were the responses of a handful of crazies that do not reflect the whole. Perhaps we should also give thanks for the democracy that allows these responses to be published, and to flood public awareness. But it must be recognized that the sentiment they express is common and that it runs deep in Israeli society. Enemies, a hate story. In the past few years, anti-Arab hatred and racism have reached monstrous proportions and are no longer restricted to a negligible minority. Many people dare to express it, and many more agree with them. All the discriminatory, separatist laws of the past few years are an authentic expression of that hatred. When Netanyahu's Israel demands that the Palestinian Authority stop the incitement against Israel, it's a case of the pot calling the kettle black. Perhaps it is difficult to measure precisely, but after 25 years of covering the Israeli occupation, and after innumerable meetings with ordinary Palestinians, I think I can safely say that the hate and racism on our side is not matched on the Palestinian side. I repeatedly find myself astounded by the fact that the majority of the thousands of Palestinians I have met over the years, all of them victims of the occupation, speak about their dream of living together in peace (while the majority of Israelis dream of "the separation" ). Yes, there are those who hate, those who carried out murderous attacks against Israelis - and only a few protested against it. But the Palestinian hatred is focused mainly on the Israeli occupation. During the Carmel forest fire of December 2010, the PA dispatched fire trucks to Israel, and apparently no one protested against it. It is doubtful that Palestinians rejoiced over the Israeli deaths then in the way that Israelis are rejoicing over the Palestinian deaths now. But even if I am wrong, even if I am blind to the facts and the hatred is indeed mutual, nevertheless it is impossible to ignore what is happening to us: Palestinian children die in an accident, and many Israelis are happy about it - and are no longer even ashamed of it. Atmosphere of sadness and pain and mourning that prevailed throughout the country in general and Jerusalem in particular, saw the people of school students Noor Huda in Shu'fat and the village of Anata, on Friday, an atmosphere of anxiety and fear, tension and a long wait, which lasted more than 24 hours until the announcement of the results of examination of the "DNA" of by doctors Ramallah Hospital. They did not announce the results of tests, but at two o'clock in the afternoon yesterday, and then handed over the bodies of children Almtfhmin who is not recognized on their physical appearance because of burning only during these tests. This was due to the occurrence of a traffic accident tragically in the way of Jaba - Ram, on Thursday because of crashes truck bus school students Noor Huda, which led to the coup the bus and burned immediately. In the chaotic aftermath of a deadly school bus crash near Ramallah on Thursday, twin girls who were believed dead have been discovered alive and well a day later in a Jerusalem hospital. Five primary schoolchildren and their teacher were killed when the vehicle collided with a truck near Jaba checkpoint north of Jerusalem. But Initial reports from the Red Crescent Society had indicated 10 were dead. The parents of Dana and Lana Abdullah Hamdan told Ma'an on Saturday how they believed their daughters were among those casualties. They trawled from hospital to hospital, and when their daughters' names were not found on any records, the parents believed that two charred unidentified bodies must have belonged to the twins. Adding to the confusion as the story developed, the twins were mentioned by witnesses as possible victims. Pictures believed to be the girls were also circulated by media outlets. Then Friday, the parents found the children alive but injured in a Jerusalem hospital. The couple are now torn between the relief of finding their children alive, and grief for the families who lost sons and daughters in the accident which also injured dozens. Described by Mahmoud Abbas as a "national catastrophe," the accident saw scenes of chaos as the injured were taken to Jerusalem and Ramallah, as Israeli and Palestinian emergency services attended the scene. The crash took place in an area of the West Bank zoned 'Area C,' where Israel has full civil and security control. Ramallah: Salem Abdullah Abu Markhiyah, who was called by the families of the dead and injured kids a national hero, was badly beaten by the Israeli military forces and hospitalised, and once he is released from the hospital, he should meet the Israeli police for investigation. Abu Markhiyah who is originally from the city of Hebron was the first on the accident scene while he was on his way to his work, coordinated the public efforts to put the fire which raged in the bus off and rescued at least 24 kids from the bus. “We used the fire extinguishers of our private cars. We were also lucky with the heavy rain and the water which made a wadi on the street,” he stressed, with some volunteers felling containers from the street water and pouring on the bus. Five-year-old Muhammad escaped the deadly crash of his school bus near Qalandiya on Thursday, but he cannot shake off the images of his classmates as the vehicle caught fire. "We were shouting, dancing and singing as we were excited about our school trip, when suddenly I saw a fire and felt heat like our teacher's description of hell," Muhammad Baker Shihadeh, now recuperating in Ramallah public hospital, recounted. His father told Ma'an that he is bruised and in shock, but in a stable condition. At least five schoolchildren and their teacher were killed, and some 39 others injured, when their bus collided with a truck near a north Jerusalem checkpoint.The class were on a field trip from Shufat refugee camp in Jerusalem to a children's park near the West Bank city of Ramallah. Muhammad was able to escape from the bus after it overturned, and before a fire whipped through the seats, his father said. He had been incredibly excited about the trip, and ran to the bus with friends on Thursday morning, excitedly discussing the games they would play later in the day, he continued. "My son told me when the accident happened the children were crying and screaming in total terror. Some escaped before the fire, but others were terribly injured and were stuck inside the bus between the seats." "I ran to the scene in a total panic when I heard," he said. "I thank God that my son is stable, but am devastated about all the children who died. I pray that God will stand beside their parents in their misery." Fathi Abu Moghli, the Palestinian Authority health minister, says the death toll of Thursday's bus crash near Ramallah was six, and 39 were injured. The police initially said 10 people were killed. At a news conference in Ramallah, Abu Moghli said of the injured one was transferred to Rafidia hospital, four to Hadassah Ein Karem, and six to a private medical center. The administration of Hadassah hospital has informed the PA that three children and a woman were being treated there. There were no deaths reported at Hadassah, he added. The driver of the truck is in critical condition at Esawiah hospital, he added. The six victims were not immediately identified due to extensive burns, he added. The PA is conducting DNA testing to identify them, Abu Moghli added. At least five Palestinian schoolchildren and a teacher were killed Thursday when their bus overturned and caught fire after a collision with a truck on a rain-slicked road in the occupied West Bank. The children, most of them kindergarden-age pupils at Nour al-Huda primary school, were on a field trip from Shufat refugee camp in Jerusalem to a park near the West Bank city of Ramallah. Palestinian police said the bus collided with a truck near Jaba, causing it to flip over. A witness told Israel Radio he saw the truck swerve head on into the bus. "The fire started in the front ... and we helped the children from the back. I saw many of them die immediately," he said. teacher were pronounced dead at the facility, which also treated 54 people injured in the accident. The Red Crescent said at least eight of the injured were in serious condition. They were treated at the Palestinian Medical Clinic as well as Jerusalem's Hadassah Hospital, medics said. Police initially said 10 people were killed, but the health minister lowered that number to six late Thursday. Officials were still trying to identify some of the bodies late Thursday. Both Palestinian and Israeli emergency services arrived at the scene of the accident, but commuters were the first to begin pulling people from the wreckage and putting out the fire. Israeli and Palestinian emergency crews later cooperated in rescue efforts. "Firefighters began to take bodies out of the bus. We saw there was nothing more to be done," said Shalom Galil, an Israeli paramedic at the scene. Doron Yisraeli, head of the Israeli police traffic unit in the area, said it had been raining and the truck had braked and skidded into the bus on the road just north of Jerusalem. "Human error, combined with the difficult conditions, led to lethal consequences," Yisraeli said. President Mahmoud Abbas announced three days of mourning for victims of the crash and ordered Palestinian flags to fly at half-mast. "Authorities will take all necessary measures to take care of the injured and provide the families of victims all they need. We consider the victims martyrs of the Palestinian people," Abbas said. Abbas sent his secretary Tayeb Abdul Rahim to meet with families of the victims. The minister of health and the prime minister in Ramallah, Salam Fayyad, are also speaking with relatives. Israeli President Shimon Peres spoke to President Abbas and expressed sorrow over the accident, Israeli media reported. "Israel will provide the victims with any medical aid necessary," he was quoted as sayin. Abbas thanked Peres for his comments and stressed "this is a great tragedy for the Palestinian people," Israel's Ynet news service reported. It said Israel's prime minister was also offering assistance. Filippo Grandi, the commissioner-general of UNRWA, the UN's Palestine refugee agency, said in a statement he was "deeply saddened" by the tragedy near Qalandia. "There is nothing more appalling to us and our communities than the needless deaths and suffering of innocent children. My condolences go out to the families and friends of the victims at this terrible time." At least 8 Palestinian children died Thursday when an Israeli truck hit a Palestinian school bus on a West Bank road, police said. Some 20 others were injured, Palestinian police spokesman Izzat Said told dpa. The truck and school bus collided frontally at a chaotic junction between Jerusalem and Ramallah, near a Jewish settlement. The bus then overturned and caught fire, police sources said. An Israeli Police Spokesman Mickey Rosenfeld confirmed the accident. He said a large Israeli police contingent had arrived at the scene and was investigating. wall erected by Israel and widespread traffic regulations that force Palestinians to move on certain roads and in certain vehicles. President Mahmoud Abbas visited some of the dozens of injured children at a hospital in Ramallah on Thursday, following the crash he described as a "national catastrophe." 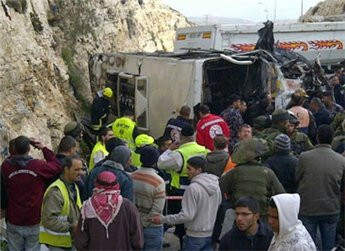 Five children and a teacher were killed Thursday in a crash south of Ramallah during a field trip, medics said. Another 39 have been injured, several of them seriously. Abbas seemed to be affected by the visit. He was accompanied by his secretary-general Tayeb Abdul Rahim and the health minister, Fathi Abu Moghli. Fatah official Nabil Shaath also joined. "This is a national catastrophe for all Palestinian people," Abbas told reporters, both for the country and the children's' parents "because what happened was unimaginable, but it was fate." He added that the PA wished a speedy recovery to the injured. Condolences poured in from near and far Thursday, as Palestinians mourned the deaths of as many as 10 children in a fiery crash south of Ramallah. Israeli leaders were among the first to extend condolences; President Shimon Peres called his Palestinian counterpart Mahmoud Abbas to express sorrow, Israeli media reported. "Israel will provide the victims with any medical aid necessary," he was quoted as saying. In Cyprus, Benjamin Netanyahu issued a statement saying the prime minister "offers his condolences for the death of the teacher and students in the accident north of Jerusalem today." The premier "is ready to provide the Palestinian Authority with any aid that may be required." The US Consulate in Jerusalem, meanwhile, said it "joins the Palestinian people in mourning the victims of the tragic bus accident near Jaba this morning. "Our thoughts and sympathies are with the families of the victims and we pray for the speedy recovery of the injured children," a post on the consulate's Facebook page said. The UN's envoy in Jerusalem also expressed "sorrow" in a letter to President Abbas. "I'm writing to express my deep sorrow about the shocking news of the death of at least eight children today in an accident near Ramallah," Robert Serry wrote. "On behalf of all the UN employees in the Palestinian territories, I send our heartfelt condolences to the victims' families and we wish a speedy recovery to those injured. "My heart and the hearts of our employees who work for the Palestinian people are with you in this tragic time. The death and injury of many is a pain felt by all Palestinians, and I join your people in mourning". Russian Ambassador to the Palestinian Authority Alexander Rodokov Thursday delivered a cable of condolences to the Secretary General of the Presidency, Tayeb Abdul Rahim, from the Russian President, Dmitry Medvedev, to President Mahmoud Abbas on the bus accident victims. Medvedev offered deep condolences to Abbas, the bereaved and to all the Palestinian people on the victims of the tragic bus accident, wishing the injured quick recovery. Palestinian leaders in the occupied West Bank and Gaza Strip expressed sorrow Thursday after a bus accident killed at least six children south of Ramallah. In Ramallah, Salam Fayyad called the fiery crash "a national disaster," and said the tragedy was felt by every Palestinian. "We express our sorrow and extend condolences to the victims' families," he said. "Our hearts are with the victims' families and we wish a speedy recovery to the injured children who remain hospitalized. This is a sad day for us here in Palestine, and may the souls of the children rest in peace." In Gaza City, Ismail Haniyeh extended condolences to the victims' families and demanded an investigation into the accident, which was between a school bus and an Israeli-plated truck. "We demand a serious investigation into the cause of the accident. ... If it was deliberate, then there's been an ugly massacre. Without prejudging the facts, we nonetheless demand an investigation." Neither Palestinian nor Israeli police have suggested foul play leading up to the crash. Ten Palestinian children were killed and 20 wounded on Thursday morning after an Israeli truck carrying a fuel tank crashed into the school bus transporting the kindergarten children near the Qalandia checkpoint in Ramallah. The bus carrying the children collided with the truck at an intersection in Jaba'a, overturned, and caught on fire. Ten children immediately died and at least 20 were injured, eight of whom are in critical condition, according to medical officials with the Palestinian Red Cross. Palestinian Authority President Mahmoud Abbas has declared three days of mourning. Ramallah-based journalist Diana Alzeer said the collision was likely an accident due to wet weather, and not politically motivated. In Bethlehem, a 15-year-old boy died this morning after a truck skidded on a slippery road and ran the boy over. A statement released by the police said they have opened an investigation and confirmed that the boy died on the spot. Emergency crews arrived to the scene and transferred the boy's body to a hospital in Beit Jala. Israelis on Facebook were celebrating the deaths of the Palestinian children, writing derogatory statements on a wall of a news post regarding the accident. The Israeli comments have gone viral on Twitter, shocking users into disbelief at the level of racism and hatred directed towards the deceased Palestinian children. Israel maintains a military occupation of the West Bank and Jerusalem, imposing harsh restrictions on indigenous Palestinians while providing privileges to illegal Jewish settlers. Palestinians are frequently attacked and harassed by settlers as well as the Israeli military, often with impunity. Following the news on the tragic accident today on Jaba road near Ramallah, due to clash of track with school bus, where at least nine children and one teacher were killed and tens were injuried, Israeli comments on facebook, were inhumane to say the least. Tali: It seems like they are Palestinian children.. Thank God.. Please note the likes on each one of the racist and hateful comments. And no one tell me this is exception and not the Israeli mainstream. Itzik: They will ask for money, since money is more important for them than children who died. Erez: Can we send another trailer? Eliran: I would send a convoy of double trailers to wipe out all these shits. Haaretz reported yesterday on these racist comments including similar ones on the Israeli police Facebook page, which could not be found. At least ten Palestinian schoolchildren were killed and 42 injured as a school bus collided with an Israeli truck in East Jerusalem on Thursday morning. Palestinian police said the bus collided with a truck near Jaba, northeast Jerusalem, causing it to flip over. The bus was on its way to Ramallah with primary school students from the East Jerusalem neighborhood of Anata. The Red Crescent said that ambulances had transferred a large number of injured people to hospital. At least eight are said to be in a serious condition. Seven bodies of the deceased have been taken to the Palestinian Medical Clinic and three are at the Hadassah hospital. Both Palestinian and Israeli emergency services were present at the scene of the accident. 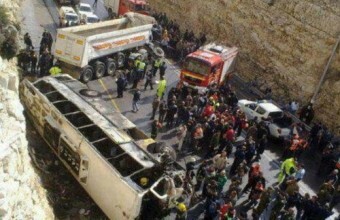 President Abbas has announced three days of mourning for victims of the crash. Following the tragic school bus accident that took place on Thursday near Ramallah, a screen capture of some Israeli insensitive and racist reactions were circulated across social networks. Israeli news website ‘Walla’ reported on the accident on its ‘Facebook’ page. The news received racist comments by extremist Israelis rejoicing and celebrating the news. The previous comments received heavy criticism by many users including Israelis, who expressed deep sorrow for the victims’ families and revolted against such racist reactions. 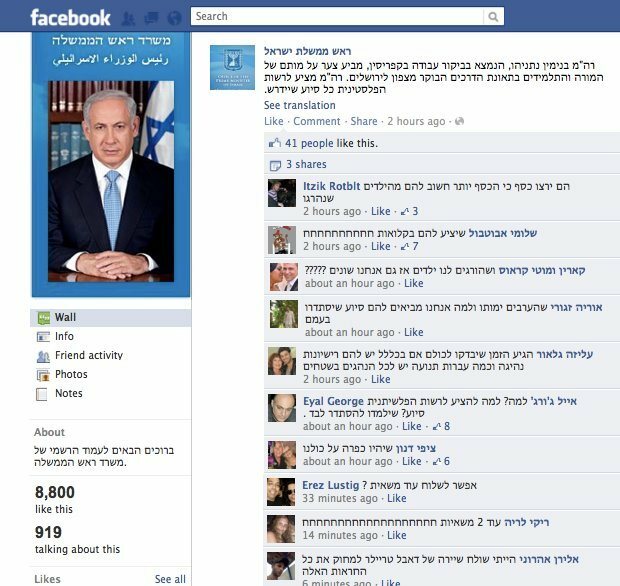 Users of many social networks deemed the comments of those extremist Israelis as “racist,” that reflected the Israeli deep-rooted hatred against Palestinians. A 15-year-old boy was knocked down and killed on Thursday in the Bethlehem village of al-Ubeidiya, medics said. Head of the Red Crescent ambulance service Abdul Halim Jaafreh told Ma'an that Khalil Hasasneh was knocked down by a truck at 7 a.m. He was on the way to school at the time. Hasasneh was pronounced dead at the scene and his body was taken to Beit Jala hospital. Police have opened an investigation into the incident. The Al-Quds Brigades, the armed wing of the Islamic Jihad, reported that one of its fighters was killed, on Tuesday evening, during what it described as a “jihadist mission” in Rafah, in the southern part of the Gaza Strip. The Brigades identified the fighter as Salem Abu Sahllouf, 25, and added that its fighters “will always remain determined to fight for the liberation of their country and people”. It further stated that “armed resistance is the only means to liberate Palestine from the Israeli occupation”. On Sunday evening, the Salah Ed-Deen Brigades, the armed wing of the Popular Resistance Committees, reported that one of its fighters was killed during a training accident also in Rafah, in the southern part of the Gaza Strip. The Brigades said that Ali Abu Aathra, aged 20, was killed after he fell off a vehicle during training. Several fighters, members of different armed groups, were killed during similar accidents in the Gaza Strip. Earlier on Sunday, a 71-year-old man was killed, and two residents were wounded, when the Israeli Air Force fired several missiles into an area east of Az-Zeitoun neighborhood, in Gaza City. The Salah Ed-Deen Brigades, the armed wing of the Popular Resistance Committees, reported that one of its fighters was killed on Sunday evening during a training accident, in Rafah, in the southern part of the Gaza Strip. The Brigades said that Ali Abu Aathra, 20, was killed after he fell off a vehicle during training. Several fighters, members of different armed groups, were previously killed during similar accidents in the Gaza Strip. The army also bombarded Ash-Shujaeyya neighborhood in Gaza city causing damage to a number of homes, no injuries. Israeli troops further bombarded Az-Zanna and Al-Qarara areas in Khan Younis, in the southern part of the Gaza Strip; damage was reported, no injuries. The army claimed the attacks targeted resistance fighters. The An-Nasser Salah Ad-Din Brigades told Ma'an Sunday evening that one of their members had been killed in an operation in the Gaza Strip. The group, which is affiliated with the Popular Resistance Committee, did not specify how Ali Juma Abu Athira died. Seven members of a Palestinian family from the town of Idhna west of Hebron were evacuated to hospital Saturday after they were poisoned by carbon dioxide and carbon monoxide as a result of an open stove. Nasser Qabaja, an official in the Palestinian Red Crescent Society in Hebron, confirmed that ambulances evacuated seven members of Al-Batran family aged 3 to 25 in addition to the parents. He explained that the family left a firewood stove used for heating on overnight. A two-year-old girl from Qalqiliya was taken to hospital on Thursday after drinking gasoline, police said. Medics said the girl was in a stable condition after mistakenly drinking from a bottle containing petrol in her house. An eight-year-old boy was killed in Hebron on Sunday night after being knocked down by a jeep, police said. Faraj al-Karaki was hit by the car in the Wadi al-Qadi area of south Hebron. Ambulance crews did their best to save the child, police said, but he died at the scene. Two fighters affiliated with the Al-Qassam Brigades died on Sunday in accidental circumstances, Ma'an's correspondent said. 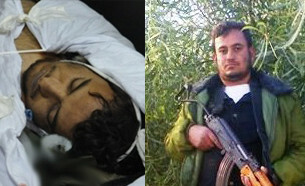 Iz al-Din al Mazir died when a tunnel collapsed and Samir Abdul Rahman, 28, died accidentally during a training exercise. Both men were from Gaza City. A 40-year-old woman and her young son died of suffocation from a firewood heater on Thursday in the Nablus village of al-Naqura, police said. The heater sucked all the oxygen from the room as the windows and doors were sealed, the police statement said. Omaymah Mahmoud and 10-year-old Muhammad were found dead by another son when he returned home, and her husband was taken to hospital in a critical condition, the report added. Police urged people not to leave heaters on overnight. A five-year-old boy died Thursday after being run over by a car north of Ramallah. Siraj Mustafa died from injuries sustained in the collision, police said. Police detained the driver before seizing the vehicle. An investigation has been opened into the incident. An explosion in the southern Gaza Strip killed a member of the armed wing of the Popular Resistance Committees, the group said late Saturday. Khalid al-Qaisi, 38, died and five others were injured in the blast at the al-Qaisi home in Rafah, the Nasser Salah al-Din Brigades said in a statement. The injured were not named. The statement said al-Qaisi was killed in action while performing a "jihad mission" in Rafah, but no other details were disclosed. A medical official, Adham Abu Salmiya, said the charred corpse of an al-Qaisi family member was transferred to Abu Yousef al-Najjar Hospital after the explosion in Rafah, which borders Egypt. A Ma'an correspondent said parts of the city "literally shook" during the explosion, the cause of which was not immediately clear. An Israeli military spokeswoman denied army involvement. The PRC said secretary-general Zuhair al-Qaisi, a relative of Khalid, was unharmed. A militant affiliated to Islamic Jihad was killed on Sunday morning, the group said, without elaborating on the circumstances. Anwar Habib, 22, "died as a martyr while performing a Jihad mission" in the Shujaiyya neighborhood east of Gaza City, the Al-Quds Brigades said in a statement. A man killed in a work accident in Israel on Thursday has been identified as Jaser Dweikat, a 36-year-old father from Nablus, local sources said Friday. Dweikat, from Beta village south of Nablus, had four daughters and two sons. He died in a Jerusalem hospital after falling from a building at work in Kfar Saba in northern Israel. Arrangements are underway with Israeli authorities to return Dweikat's body to his village later Friday, locals told Ma'an. A man was killed and another injured when a tunnel collapsed under the border with Egypt in the southern Gaza Strip on Thursday morning. Bilal Shaat, 24, from Khan Younis, died while working in the underground passage near al-Salam neighborhood in southern Rafah, officials said. An injured colleague was transferred to Abu Yousef al Najar hospital in Rafah along with Shaat's body, they added. Since Israel tightened its blockade on the Gaza Strip in 2007, goods smuggled in from Egypt through underground tunnels have provided a lifeline to the coastal enclave. Under siege, Gaza's economy collapsed and a 2011 UN study found that unemployment rates in Gaza were among the highest in the world. Gaza officials say over 160 young men have died at work in smuggling tunnels, but with a lack of alternatives many are still drawn to the hazardous profession. A Palestinian died Thursday after falling from a building at work in northern Israel, Hebrew media reported. The man, from Nablus, died in Kfar Saba, Yedioth Ahronoth reported. A 21-year-old man was killed on Monday after he fell into a well while doing construction work near Hebron, police said. Rami Ahmad Ghnimat died in intensive care in Al Ahli hopsital in the southern West Bank city, after he plunged to the bottom of the water well in nearby town Surif, Hebron police chief Ramadan Awad said in a statement. Prosecutors have ordered that his body remain in hospital so that an autopsy can determine the cause of death, the statement added.